Christopher Dodd once said “When the public’s right to know is threatened, and when the rights of free speech and free press are at risk, all of the other liberties we hold dear are endangered”. And thus the obvious questions to ask would be who threatens the public’s right to know and who is it that ensures that the Press isn’t free after all. Is it then the government? Or is it that establishment, or the ecosystem, that functions with or without the patronage of the government in power? Recently, online portal The Wire published a story “exposing” Amit Shah and his son Jay Shah’s alleged scam. The story, written by a journalist named Rohini Singh, was so terribly researched that it was shred to bits in the matter of a few hours. The Wire was subsequently forced to correct some elementary errors that shockingly passed editorial checks, and it also received a defamation notice from Jay Shah seeking Rs. 100 crores in damages. The portions that I have highlighted in red above is what caught my eye. While publicising this poorly researched story, The Wire said that the journalist in question wrote about Robert Vadra’s dealings with DLF. This was necessary to pitch Rohini as some upright and ‘neutral’ journalist, especially after some reports, where she was involved as a journalist of The Economic Times, were heavily criticised on Twitter earlier for partisan reporting during the Uttar Pradesh assembly elections. Even if we leave aside Uttar Pradesh reporting controversies, the Vadra episode too is not without controversies. Though this time, the person in question is Mr. Varadrajan. While Rohini Singh’s story about Vadra’s dealing with DLF did raise some questions about DLF dealings and Shalini Singh herself gave credit to Rohini Singh for her initial reportage, the scam as we know it today, was broken by Ms. Shalini Singh in 2012, substantially building on the information put forth by Rohini Singh, which as the evidence suggests, was not carried by the then Editor of The Hindu, Mr. Siddharth Varadarajan, for 7 long months. All of this leaves a serious question mark on Mr. Siddharth Varadarajan’s professional conduct and his commitment to the truth. Ms. Shalini Singh had joined the Hindu in February 2012 and she submitted the Vadra story around March-April 2012, after emailing detailed questionnaires to both Mr. Robert Vadra and the DLF. She further says that after she submitted the Vadra report, the editorial team communicated to her that the story wasn’t good enough and couldn’t be carried. As a result, the story remained shelved for 7 months. The Editor of The Hindu at the time was Mr. Siddharth Varadarajan himself. In effect, the onus of the Robert Vadra scam story being shelved for that duration lies squarely on his shoulders. In an earlier interview, Ms Shalini Singh has said that when she realized that there was no interest in carrying the story, she sought permission to give the story along with the documents to Mr. Prashant Bhushan who was at that time involved with “India Against Corruption”. Although there were several opportunities to carry the story even then, none were taken. The story was eventually only carried AFTER Mr. Prashant Bhushan’s press conference where he talked about the dubious business deals of Robert Vadra. Ms. Shalini Singh is a seasoned investigative journalist who prefers to call spade a spade. I personally spoke to her and she confirmed to me that disclaimer of the documents revealing no illegality or impropriety was not her conclusion but an editorial intervention. Her opinion, as evident from her other articles, television interview, tweets and my conversation with her, was that the scam not only implicated Mr. Robert Vadra but also landed at the doorstep of then Haryana Chief Minister Hooda and Congress President Sonia Gandhi herself. One might then ask – if there was “no illegality or impropriety”, what was the point of first inordinately delaying the the story and then later carrying it with such fanfare? These revelations bring forth some glaring questions. What was Mr. Varadarajan’s motivation to shelve a story as explosive as this for 7 long months only to publish it after Prashant Bhushan’s press conference, that too with a caveat exonerating Robert Vadra? And if he did, how could he in good conscience, gloat over his credibility by citing how The Hindu broke the Vadra scam (we will see this gloating later in the article)? Ms. Shalini Singh’s stories have never been questioned. Yet, The Hindu did not stand by her in this case and she eventually left the organization in 2014. It is thus amusing, that today Mr. Varadarajan and The Wire would use the credibility earned by Ms. Shalini to pass off their current shoddy journalism as investigative journalism of merit; to claim that they pursue stories regardless of political color and beyond party lines. To quote from Ms. Rohini Singh’s Facebook post – “News is something someone wants to suppress. Everything else is advertisement. Intimidation and harassment are tools often used by powerful people to get journalists to toe their line”. Freedom of Press is said to be curbed when the public’s right to know is threatened. While the usual suspects, including Mr. Varadarajan today, erroneously say that the freedom of press in under threat, was it not, when Siddharth himself ensured that the public’s right to know was trampled upon for 7 long months? Ms. Shalini Singh is no victim. But it would certainly seem like Mr. Varadarajan has a lot to answer for. After I pursued this story, I felt it would be fair to get Mr. Varadarajan’s version of facts. Hence, OpIndia forwarded a detailed questionnaire to Mr. Siddharth Varadarajan on my behalf to which he graciously responded. Following is the unedited responses of Mr. Varadarajan (my questions in bold and his responses in italics) followed by my observations. 1. Ms. Shalini said she submitted the Vadra Scam report to you on March 2012 and you said that “it wasn’t good enough”. What was wrong with it? 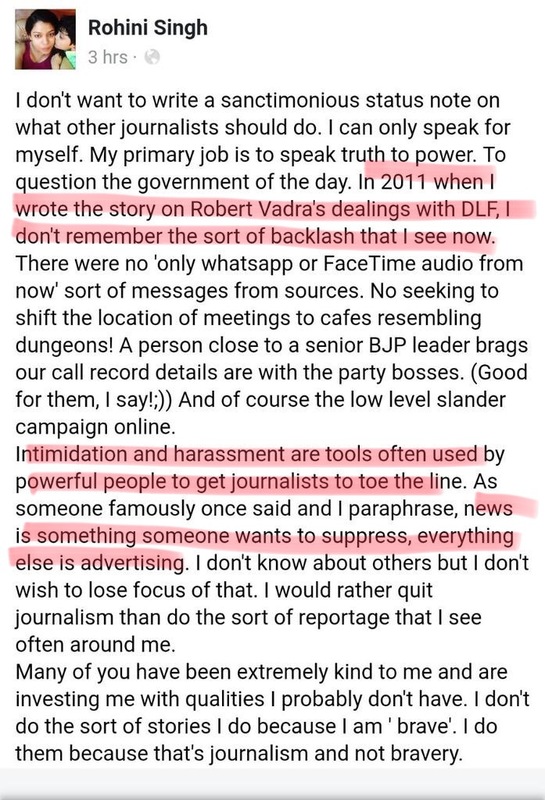 Mr. Varadarajan : I took over as Editor of The Hindu in the third week of January 2012 and was the one who asked her to work on the Robert Vadra stories based on a set of papers that a colleague had received and passed on to me. That was soon after she joined The Hindu, perhaps in February, 2012. The source of the papers had indicated that they disclosed violations of the law by Sonia Gandhi’s son-in-law and I was thrilled to be able to pursue this story as the first big expose of my editorship. She filed a story as per my inbox in April 2012. Since the basic facts of Vadra’s dealings had already been broken by Rohini Singh in the ET in 2011, I had hoped for a substantial follow-up in terms of new material that would justify picking the threads on a story that someone had already broken so many months later. I had hoped for a story that I could use as a big splash. Sadly, the story was not of that calibre and I encouraged her to keep at it, in particular to find details of a transaction or dealing that was illegal or might be illegal. @KanchanGupta Not the 2G scam but *stories* on 2G, You clearly have not been reading Shalini Singh’s pieces. //platform.twitter.com/widgets.jsIt is then amusing that four years ago Vardarajan takes to twitter to bask in the reflected glory of Ms. Shalini’s investigative journalism that he tried to shelve altogether, and now he believes that the same story was not any substantial follow up to Rohini Singh’s story. Though Mr. Varadarjan likes to insist otherwise, the motivation for which could not be immediately ascertained, a simple comparison of both stories reveals that Shalini Singh’s story is indeed “a substantial follow-up in terms of new material”. It reveals Vadra’s entire bouquet of properties, details financial chicanery, cooking of balance sheets and fraud, particularly “raising questions about his ability to buy so many high value properties with zero capital”, while giving a 360 degrees perspective on the issue by simultaneously shining the light on DLF’s own management integrity and possible financial compulsions. In contrast, Rohini Singh’s story was more about Vadra’s “business acumen “and liberally quotes him celebrating his “own talent”. 2. Ms. Shalini said that you shelved the story for 7 months and then eventually ran the story AFTER Mr. Prashant Bhushan’s press conference. If the story wasn’t good enough, why did you run the exact same story after 7 months? Mr. Varadarajan : It was “shelved” but remained a work in progress. The problem was not that the story was “not good enough” but it wasn’t good enough for what we had wanted and I kept pushing Shalini to dig deeper, get more details, especially on the violation of laws which I was personally convinced had taken place, but for which we had to demonstrate some evidence. When Prashant Bhushan held his presser, the story dynamic changed, and we ran a story based on whatever she had because even if we never had enough to market our story as a “breaking story” earlier, we certainly had enough to present it as a major backgrounder now that the Vadra’s business deals had come back into the news. We had the biggest package on Vadra, and, more importantly, kept up the tempo as new facts began to tumble out, especially with Ashok Khemka’s revelations. Shalini Singh and Chander Suta Dogra in Chandigarh both reported extensively on various new details that began to emerge. It would defy common sense for Ms. Shalini Singh to pass on a ‘work in progress’ to a political outfit. One would imagine that IAC’s safety net came from the fact that the documents, on the basis of which they were conducting the presser, were given to them by a seasoned journalist who had independently exposed the 2G scam from 2007 to 2014 and that Shalini Singh had connected all the dots independently. Ms. Shalini Singh maintains that the story on the basis of which Mr. Bhushan conducted the press conference was given to him by Ms. Shalini herself with Mr. Varadarajan’s due concurrence. How then, did Mr. Bhushan’s press conference “change the dynamic of the story” as he claims now. Mr. Varadarajan says that the story broken by Ms. Shalini had no merit to begin with, then how would he explain Mr. Khemka swinging into action within days of the release of the story, considering no action had been taken prior to Ms. Shalini’s expose being printed? 3.An editorial decision was taken to add a caveat to Ms. Shalini Singh’s original story that read “Though the documents reveal no illegality or impropriety on the part of Mr. Vadra, they do raise the questions of why DLF – which is a publicly traded company – would enter into multiple business transactions with him on terms that appear highly preferential”. We spoke to Ms. Shalini Singh and she maintains this was an editorial edit and wasn’t a part of her original article. Her investigation DID NOT lead her to believe that the “documents reveal no illegality”. Mr. Varadarajan : I edited her story so I take full responsibility for everything it. I don’t have the time to make a comparison but I suspect there were dozens of sentences that would have been rewritten and would have said things that were not in her first draft. That is what happens in editing. 3A. Then why was it added? Mr. Varadarajan : For one, it is a statement of fact, borne out by the unfortunate reality that the Modi and Khattar governments have so far failed to file any criminal charges against him. But the second part of the sentence is one that any editor will recognise as one that raised the central question about this deal: that DLF had shown favours to Vadra because of who he was. This sadly sounds more like the kind of bizarre parallel a politician would make rather than something that could be coming from a senior editor. It is indeed tragic that Mr. Varadarajan has conveniently ignored the fact that the Modi and Khattar governments have initiated inquiries into deals by Vadra, and there is Dhingra Commission Report that details the wrongdoings. Hooda has obtained a court stay on release of the Dhingra Commission Report. If there was indeed no criminal illegality, why would Hooda seek the shelter of a court stay? If Mr. Varadarajan was as much of an independent media crusader as he claims to be, surely he should push for the Dhingra commission report to be made public so that the alleged misdeeds are suitably punished, instead of rushing to conclude they are innocent, despite the fact that he himself has published stories that establish illegality? 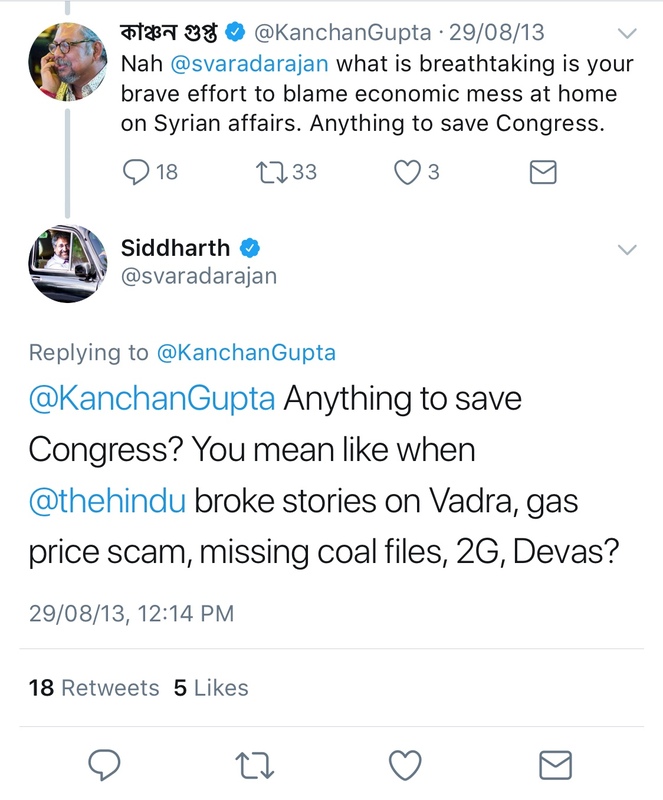 And if Mr. Varadarajan thinks there is inaction on the part of the Modi government, then instead of using that inaction as his shield (considering he is one of PM Modi’s greatest critics), he should perhaps demand action. 3B. Whose decision was it to add the caveat? Mr. Varadarajan : I don’t recall, to be honest, but the sentence is elegant and so I am happy to take credit for it. Apart from what I have already said about it, the ‘caveat’ was intended to serve the purpose of providing some additional insulation for The Hindu in the event that Vadra’s lawyers attempted to file a defamation case. 3C. Since you were the editor of The Hindu at the time, was it your decision to add the caveat? Mr. Varadarajan : Yes, I take full responsibility for every word in the published story. The jury is out on whether in a serious investigative story with such severe political consequences, an editor should comprise on accuracy in favor of “elegant sentences”. Mr. Khemka acted within days of the story so clearly everyone else could see the merits of the investigative story except for the editor himself. ‘The unfortunate reality’ is that Mr. Varadarajan, instead of being contrite is “happy to take credit” for his error. “Everyone is entitled to their opinion of any story, particularly a senior editor like Siddharth Varadarajan, and they must exercise that right. If the story “sadly’ never was, “of that calibre”, why on earth is he taking credit for it on social media? Also, can he explain why this delayed and “shelved’ story created an uproar and not the earlier ET story? Again, why is my story still under discussion, considering it was done and dusted in 2012 and I am not the one bragging about it? Allow me to jog his memory about the “calibre’” that perhaps those other than himself could see, including IAC, which launched its political career with this issue. “Director general, land holdings and land records and inspector general of registration, Haryana, Ashok Khemka in October 2012 set aside the mutation of Mr. Vadra’s property giving effect to the sale deed in favor of DLF. “Mr. Khemka’s decision came in the wake of an inquiry he conducted following the publication of a story, ‘behind robert vadra’s fortunes, a maze of questions,’ in The Hindu on october 8, 2012”. This is not my version of the outcome of my story but a fact which incidentally, forms the second paragraph of a story in The Hindu itself. It is indeed tragic that Mr. Varadarajan has resorted to trashing the very story that he prided himself with. Perhaps Mr. Varadarajan is questioning the authenticity of Ms. Shalini Singh’s expose because it suits his current needs to shift the glory onto other journalists. Perhaps the world of journalism functions on the principles of reflected glory. Either way, it seems like we will never know the real reason why the Vadra Expose by Ms. Shalini Singh was shelved for 7 months and why the public’s right to know was trampled upon then by Mr. Varadarajan.